Click your username in the top right corner and choose Settings. Click the Security tab (see Figure 1). Figure 1: Manage your Dropbox Security settings. As always, since Dropbox is a cloud storage service, you’ll want to be careful which files you choose to store and share. 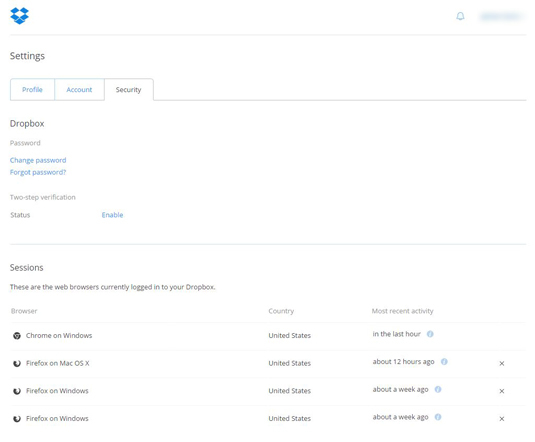 Dropbox stores your files on its servers, and though Dropbox has a good reputation for security, there is always the possibility of unauthorized access. Change/forgot password: Yep, you can change your password. Fairly self-explanatory! Two-step verification: This takes account protection a bit further by also requiring a six-digit security code in addition to your password. You need to use this code whenever you sign in to Dropbox or connect a new device to your account. View sessions: You can see a list of Web browsers that are currently logged into your account. If you use Dropbox on various computers and mobile devices, you will see several entries on the list. If you have concerns about whether someone is accessing your account without your permission, hover over the information icons to view the date/time of access and the IP address of the device that’s accessing your account. You can use that IP address to track down any unauthorized users. Devices: You can see all the devices you’ve linked to your Dropbox account. Again, if you’re using Dropbox on multiple devices, you’ll see all those devices. Hover over the information icon to see the IP address of the device. If you don’t recognize any of the devices or IP addresses, you can disconnect them and track down who they belong to. Apps linked: You can see a list of all the apps you’ve linked to your Dropbox account, such as Facebook and Twitter (which you can link to on the Account settings tab). If you have Dropbox for Business, you can link tons of other apps (Dropbox claims to have over 300,000) to your account for increased productivity and collaboration. Visit Dropbox for Business for a list of apps.